Synthwave is a style that attempts to recreate the atmosphere of 1980s culture, films and video games and celebrates the nostalgia for this era's unique sound. The same way the new found fondness for the visual aesthetics of this style, the sound design of this package incorporates all the beloved details the collection of genres stands for. 131 Oneshot Drum Samples (44.1 kHz, Stereo, 16-bit WAV). You can listen to the demo showcase at YouTube and SoundCloud. For more detailed feature information and price visit the product page XT - Synthwave. What do you think about this sound library? Leave a comment on Twitter, Facebook, or YouTube! Intergalactic and nebulous in quality, your journey into deep space can begin now. With a heavy focus on frequency- and otherwise modulated wavetables as well as spectral samples, you can expect celestial and cosmic pads and textures, full of shimmering and enigmatic sweeping motions. Supernova is a new sound extension for the RAPID Synthesizer, designed to excite your production with an "intergalactic and cosmic quality". Included are new wavetables, multi-samples, drum samples and presets, ready for sound design and music production. For more detailed feature information and price visit the product page XT - Supernova. Future Bass is a highly innovative and modern style with a great bandwidth of sound design concepts. Get a head start and directly jump into the genre, supported by melodic uplifting harmonies, versatility and energy. Future Strike is a new sound extension for the RAPID Synthesizer, introducing 'versatility and energy' conceptualized for Future Bass productions. Included are new wavetables, multi-samples, drum samples, vocals and presets, ready for sound design and music production. For more detailed feature information and price visit the product page XT - Future Strike. NEW RAPID Version - 1.6.0. 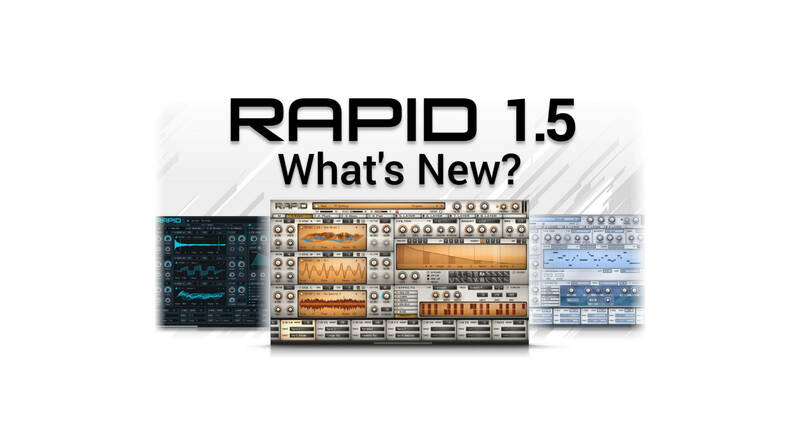 We updated Rapid to version 1.6.0 and added new oscillator inserts and effect slots. PM from Oscillator is a powerful insert effect which allows you to create complex "FM" sounds using another oscillator as modulation source. There is also a new RM from Oscillator and Feedback PM insert. The Glitch is an effect which allows you to jump back in time. Choose one of the four sequences as source and the current selected one tells the Glitch how far it has to jump back. An up to 4-Band dividable Multiband Saturator with sixteen switchable per-band types to apply dynamic and modulation processing. Asymmetric distortions, hard non linearities, bit crush, feedback, ring modulators and even limiters are available. Tuneable delay times with and additional Tonal Delay for very short and percussive feed backs and echos. 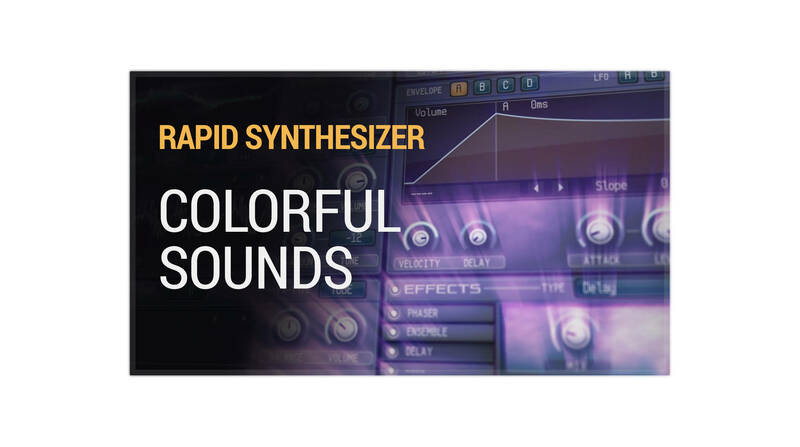 Ideal to colorize your drum loops or just reshape sounds. A Tapestop processor to hold and continue your sound at arbitrary positions. There are various other improvements, here is the complete Change Log for more details. As always, if you're a RAPID customer, you can get the update for free. Visit your Purchased Products to get the latest downloads. Enter the deep house lounge and dive into urban midnight vibes, fabulous laid back grooves and a rich sound experience full of many tonal complementariness and homogeneously fusing timbres. Deep House is a new sound extension for the RAPID Synthesizer and includes new wavetables, multi-samples, drum samples and presets, ready for sound design and music production. For more detailed feature information and price visit the product page XT - Deep House. We updated the Rapid Synthesizer User Guide. It is now available as downloadable PDF manual. The 100 page strong document contains all in-depth details you need to now to operate Rapid to its fullest capabilities. NEW RAPID Version - 1.5.0. We updated Rapid to version 1.5.0 and added an overhauled scalable 16:9 HD user interface, ready for modern 4K displays. Hardware accelerated drawing via graphics processing unit and OpenGL also relieve the processor and allows for smooth 60 frames per second visualizations. All wavetable effects are now drawn in real-time, visualizing the parameter changes in the display, making it easier to understand how the waveform is processed. Thirteen new wavetable effect models including Asymmetric Clip, Sync Add, Formant Shift, Bend Side/Mid/Double/Mirror and Phase Overlap 2x/3x. Experience the emotional nature of trance music in its purest form . Trance Essence is a new sound extension for the RAPID Synthesizer and includes new wavetables, multi-samples, drum samples and presets, ready for sound design and music production. For more detailed feature information and price visit the product page XT - Trance Essence. NEW RAPID Update - Version 1.1.0. The wait is finally over. Wavetable & Multi-Sample import! RAPID adds supports for custom user libraries. You can now import and add wavetables with various frame sizes, single-samples, multi-samples with different velocities and round robin and a special resynthesis method allows the creation of new exciting synthetic textures by manipulating the spectral content of any source sample. Take a look at the Version History for a complete list of changes. Additional suggestions about the added features? Tropical grooves, catchy melodies and open sounding Balearic vibes will spark a mood ideal for the ever coming season of feel good music. Tropical Delight is a new sound extension for the RAPID Synthesizer and included new wavetables, multi-samples, drum samples and presets, ready for sound design and music production. For more detailed feature information and price visit the product page XT - Tropical Delight. Glowing warm like sunshine, inspired by classic analogue attributes, merging the best of both digital and analog worlds. Vintage Sol is a new sound extension for the RAPID Synthesizer and includes new wavetables, multi-samples, drum samples and presets, ready for sound design and music production. For more detailed feature information and price visit the product page XT - Vintage Sol. 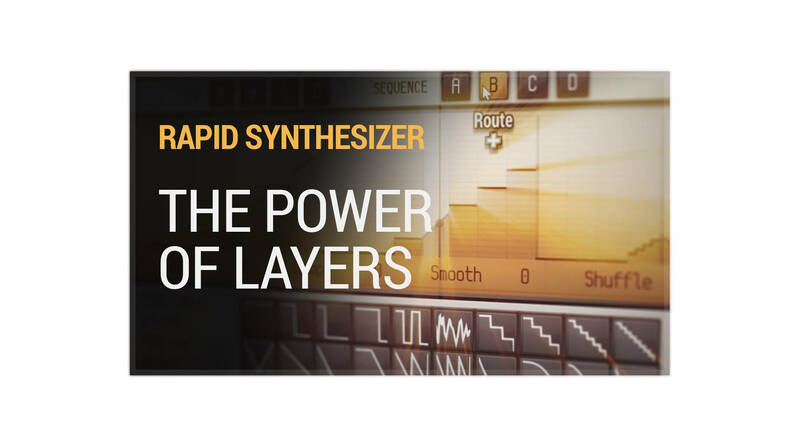 You can now finally get the RAPID Synthesizer for MacOS X.
Checkout the newest Demo Version! Pure bouncing big-room power with an electric touch. Electronic Energy is a sound extension for the RAPID Synthesizer and includes new wavetables, multi-samples, drum samples and presets, ready for sound design and music production. For more detailed feature information and price visit the product page XT - Electronic Energy. 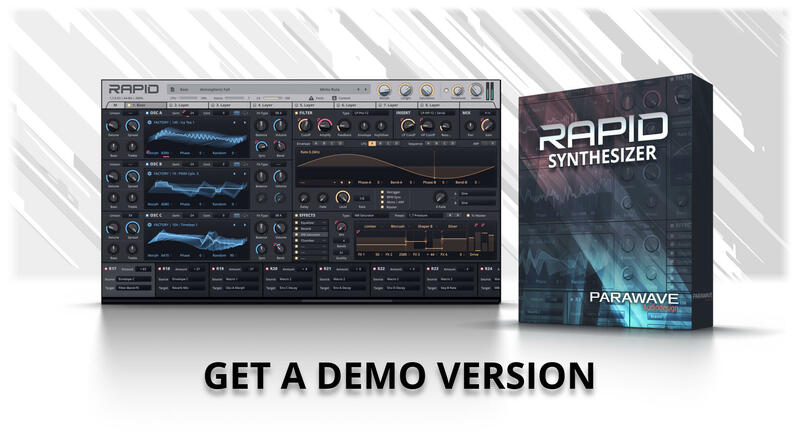 After a long development cycle and fine-tuning process, the creation of many wavetables, multi-samples and hundreds of presets we proudly announce the public release version of our first product the RAPID Synthesizer. 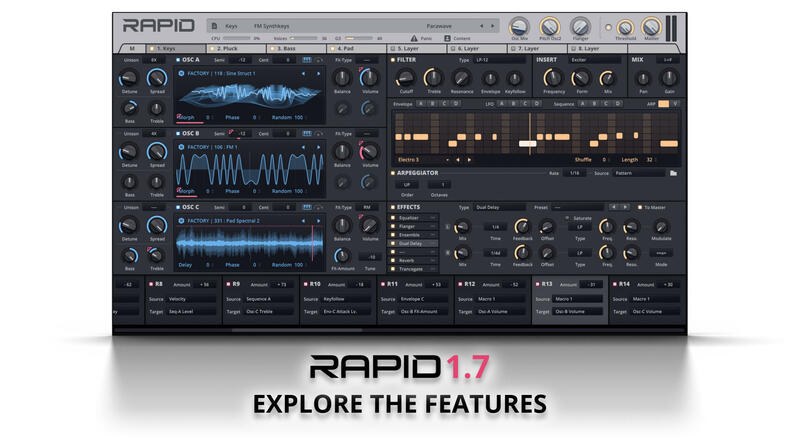 We hope that with RAPID you will find a new companion in your daily sound design and music production process. From the beginning, our design goal was to bring a fresh new user experience that will convince with sonic quality an ease of use. For the future we try to constantly enhance the workflow and develop new synthesis features requested by our customers, or maybe by you? Make sure to tell us your ideas, or any suggestions, you think will improve RAPID. For sure we will think about it! For more detailed feature information and price visit the Overview or Product page. Be sure to check out the Trailer and Factory Sounds (Demo Showcase). What do you think about RAPID? Let us know on Twitter, Facebook, YouTube or one of your preferred platforms.